Strobe arms and clamps are very important - you need to easily be able to move your strobes around for different lighting scenarios. Some people use 2 arms for WA, and 1 arm for shooting macro, although I prefer to use 2 arms for macro also, since it gives me more options for strobe placement. There are different opinions on what arm lengths are best, I like using a 6 inch and an 8-inch arm on each side. I use this for macro and wide-angle, it gives me a lot of flexibility to try different strobe positions. Good quality clamps are important, I once bought cheap ones, and they stopped working after a few months. I now use ultralight ball and joint clamps. Read this article to find out why you should buy good quality arms and clamps. Strobe arms can be straight arms or flex arms. Most dSLR users use 1 or 2 straight arms for each strobe, but flex arms are popular with compact camera users. They are light, less expensive than arms + ball & joint clamps, and easy to reposition. Since dSLR underwater housings seem to be getting heavier and heavier underwater, some arm manufacturers are now selling buoyancy arms. For example, Stix arms, and also INON buoyancy arms. These arms add extra buoyancy to your UW setup. As an alternative, you can order some Divinycell and make your own buoyancy arms. Divinycell is a hard, foam substance that doesn't compress at depth, so its buoyancy is the same at different depths. The labor of holding steady a heavy camera rig underwater, especially over long dives, can cause extreme wrist/arm fatigue, even contributing to long term muscle and joint problems. Thus, it is highly recommended for shooting comfort and for easing the task of maneuvering a camera to attain neutral rig buoyancy. To achieve this, an ideal material is Divinycell, which unlike many types of foam, does not compress at depth, thereby maintaining the same buoyancy characteristics throughout all levels of the water column. Divinycell can be cut and shaped with a box cutter and mounted with zip ties. Those with more time and motivation can use glue to more permanently fix the material on camera gear. The material should be mounted, as much as possible, on high points of the rig so that it is pulled up, not pushed up and prone to turning upside down. Also, fixing the material at the center of gravity will minimize the back or front of the rig to rise. Most photographers prefer a slightly negative buoyancy so the rig doesn't "run away" or keep rising into the face. Google "divinycell" for additional info and suppliers. 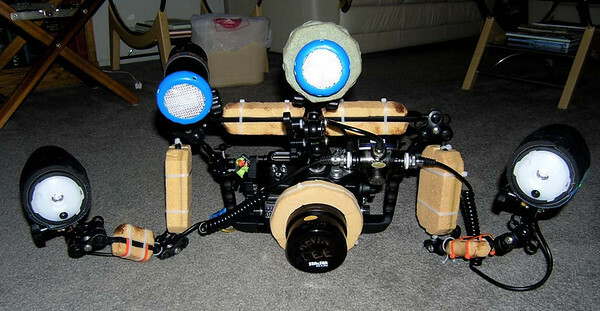 And example of Divinycell mounted on an underwater rig is shown below. Kevin's rig, outfitted with lots of Divinycell to help make the rig neutrally buoyant. Sync cords, sometimes also called sync cables, are used to connect a strobe or TTL converter to a housing. These cords allow an external strobe to synchronize with your camera, when you take a photo, so your photo is exposured from the strobe light. The sync cord must be compatible with your strobe, and with the "bulkhead" of your underwater camera housing. The bulkhead is a waterproof port where the sync cord attached to electronics that are inside the housing, eventually leading to the "hot shoe" of your camera, so that your camera can trigger the stobe. 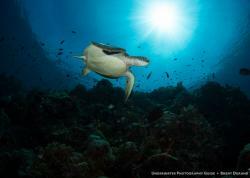 For example, Sea & Sea and Inon strobes accept "nikonos" style 5-pin cords, while ikelite has their own pin structure. The other end of your sync cord must match the pins in your housing bulkhead. #1 – via a hard-wired sync cord that connects to your housing via a bulkhead. The camera must also have a “hot shoe” connection for this to work. All dSLR housings and cameras support this method. Some compact cameras and even fewer compact camera housings support this method. Most higher-end strobes support a sync cord connection. #2 – using the pop-up flash of the camera and a fiber optic cable to carry the light to the strobe sensor. The strobe will slave off the camera's internal flash. Most cropped sensor dSLR cameras have pop-up flashes. Most full-frame cameras do not. Some dSLR housings like Nexus housings and Seatool support this method, and all compact housings & cameras support this method. Most strobes support this method to varying degrees. #3 – Using a pop-up flash and no fiber optic cable. The strobe slaves off the camera's internal flash. This is the similar to method #2, but without using a fiber-optic cable. The strobe must be able to "see" the internal flash, via a built-in detector. Some strobes support this method. The superior method is subject to debate. For the longest time underwater photographers have preferred method #1, because the strobes are sure to fire, camera housings can be smaller (they don't need to support a pop-up flash), and the battery of the camera is not used firing the flash. However, recently a number of photographers have started to prefer firing their dSLR's via fiber optics. They are tired of flooded sync cords and bulkheads. A few dSLR housings, such as Nexus and SeaTool, support a pop-up flash. Long battery life of recent dslr models means that even with the flash, you can shoot all day without needing to change batteries. And fiber optic cables have become quite reliable. Well, the choice is yours! Sync cables fire your strobes when you release the camera shutter. Make sure you get the right sync cable for your strobe + housing combination, Ikelite strobes take nikonos-type sync cords, and S&S or Inon strobes take 5-pin sync cables (e.g. - a Sea & Sea sync cord). Sync cords are quite reliable, until they flood or short out. Always have a spare. Maintain them carefully (see the maintenance section). Cameras can also be fired via fiber optics, using the internal flash of the camera. Most compact cameras fire strobes this way. The internal flash must be set to fire at it's lowest setting. The problem is that this uses up more battery life, and also some compact cameras are very slow to recycle their internal flash. Some strobes have a detector that can "see" the internal flash of a camera, and will slave off that flash. Occasionally the strobe will not fire if the strobe can't "see" the flash. I successfully used a $75 fantasea strobe with a fuji F10 camera for quite a while in this manner, for macro photography. Most people not using sync cords will use a fiber optic cable. This is an inexpensive cable that carries the flash along a fiber optic cord from the internal flash up to the strobe, ensuring that the strobe slaves off the internal flash with 100% accuracy. Almost all compact camera housings support this, and some dSLR housings even have room inside the housing for the internal flash to pop up and fire the strobe. A few strobes, such as the Fantasea Nano strobe, will actually work well optically even without a fiber optic cable. But there is always the risk that the strobe won’t “see” the internal flash if it’s blocked. It worked well for me with my Fuji F10, but try this at your own risk. Some people have trouble using the viewfinder on a dSLR housing, due it's small size, so they have a viewfinder magnifier attached to their housing. When you order an Aquatica or Subal housing, an external viewfinder offering additional magnification is available for an additional cost. Inon also makes 2 viewfinders, straight and at a 45-degree angle. A 45-degree viewfinder is helpful for macro shots, and getting low in the sand while shooting a subject. These have been attached to many different housings, although some housing modification is often needed, and this needs to be discussed with the dive shop you order from. You may need to purchase a diopter for use with your wide-angle lens. Please see the wide-angle equipment section for more details. Submitted by Marsh (not verified) on Fri, 2011-09-16 23:35. I'm a macro shooter upgrading to an SLR rig from a G9. I've decided on S&S RDX-600D/T3i set-up and either the Canon 60mm EF-S or 100mm 2.8L lens. On my G9, I could push a button on the Canon housing to go from normal to macro, which was handy for shooting some things other than close-ups, like reefscapes and fellow divers. Unfortunately, there's no accessibility to the mechanical macro control on those SLR lenses that offer it. So, unless I want to change the port and lens topside for another dive, I'm more limited with the macro setup. I've done some surface testing and noticed I can add a wide angle adaptor to my standard 18-55mm kit lens on my old Rebel (zoomed to 55mm) and get a reduction, without visible distortion from 55mm to 35mm using .42X wide angle attachment I had for the G9 (not UW type). S & S now makes a macro port with a 67mm screw thread for adding on color filters and close-up lens for super-macro. I'm wondering if I could add on Fantasea's BigEye M67 wide angle FE to reduce either the 60mm or even the 100mm macro, so I have at least some alternatives other than macro shooting. 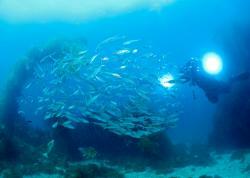 Most live-a-board and group dives don't give one the opportunity to dive the site twice and change lens. Anyone tried using a FE or WA add-on lens to a SLR housing? My surface experimenting says it might work, I even moved the wide angle adaptor 5/8" away from the prime lens (with a macro ring I had) and I got the same results, so I'm hopeful. I realize if this were to work, it would most likely be more successful with the 60mm over the 100mm since the add-on lens were designed for 35mm lens on average. I've considered going back to my original plan of upgrading to a 4/3 system like the PEN E-PL2/PT-EP03 set-up, because it has an excellent 45mm Leica macro and is closer to P & S sensor size. But the Canon T3i has the higher resolution and the new video zoom capabilities without losing HD resolution (nice to zoom in on the macro without moving the camera), so I'm trying to come up with a solution using the SLR. Anyone try something like this with good or bad results? Submitted by Hoefje77 (not verified) on Sun, 2011-01-23 17:40. Scott, have you ever dived with a tripod? If so, would you be able to post a review about it? I absolutely LOVE this site and use it for reference at least once a week! Thanks for doing such a great job!